Erik Buell Running On Electric Power | Hupy and Abraham, S.C.
Erik Buell is one of those guys who just keeps running, like that battery-powered bunny. A genius in motorcycle design and a master in frame suspension technology, he was at the top of his game while manufacturing the 1190R series motorcycle for street use. Starting out as an engineer at Harley-Davidson in 1979, he worked on a number of projects, including development of the Porsche-designed Nova engine. A racer at heart, Buell was able to purchase designs, parts and permission to produce the Barton motor, a company from Britain that ceased production. He left Harley-Davidson and founded the Buell Motor Company in order to pursue his passion for racing motorcycles. The success of his new company revived an interest from Harley-Davidson, which resulted in the motor company purchasing a controlling interest in the Buell Motor Company. This gave Buell the needed capital to continue working on development and design changes, until 2009, the recession caused Harley-Davidson to drop the relationship, and Buell was out on his own again. Forming the new company, Erik Buell Racing (EBR), he continued to work on and market motorcycles for both racing and street use, including the 185 horsepower 1190R series. This company failed twice, ending up in receivership in 2015, and the world thought it was the end for Erik Buell’s career in manufacturing; enter the era of the electric-powered motorcycles. Erik Buell was part of a team exploring electric-powered motorcycles while he was still at Harley-Davidson. After the failure of his company, EBR, a noticeable silence came from Erik Buell. The Buell faithful were optimistic the world had not heard the last from the eccentric innovator. He did not disappoint. A new venture was unveiled, announcing the partnership of Erik Buell with Frédéric Vasseur, Alfa Romeo Formula 1 founder, to manufacture electric-powered two-wheeled vehicles. Vasseur also founded Spark Racing, a company devoted to Formula E race cars. Together, the team developed an electric bicycle and electric motorcycle. The duo of cycles hasn’t been formerly introduced, but it is expected that they will be fully unveiled near the end of April 2019. 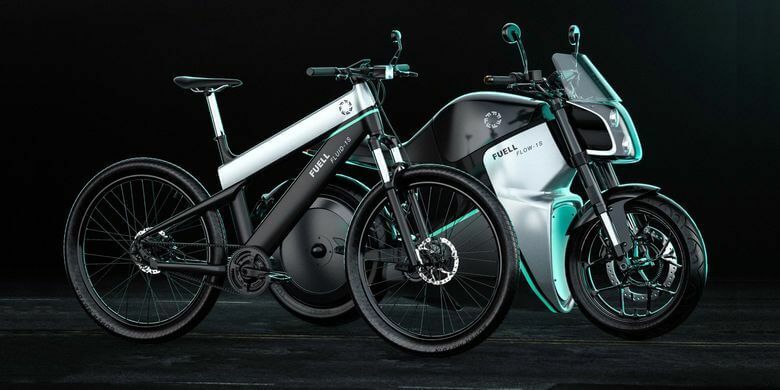 In an interesting play on words, the newly formed company is called Fuell, and offers two models, one a mountain bike-inspired electric bicycle, the other an electric motorcycle. The bicycle version is the Fuell Fluid and Fluid 2 model. It comes with either a 250- or 500-watt battery system, and while in Eco mode, utilizing pedal assist, it boasts an impressive range of 125 miles. It is capable of speeds up to 28 mph, with a cost estimate of $3,295. The motorcycle is called the Fuell Flow and Flow 2. It comes in an 11 kW version, with 14.8 horsepower, or the larger 35 kW, with 47 horsepower. The Flow 2 is capable of highway speeds for short distances, but it is primarily designed as a local commuter. Unique to this bike is the motor which is in the rear hub, combined with a single-side swing arm and off-center mono shock. Buell’s frame suspension work is clearly evident in this design. The hub motor eliminates the need of a secondary transmission and the traditional chain or belt-drive design. The Fuell Flow has and estimated price of $10,995, much more affordable than the Harley-Davidson LiveWire, which costs just under $30,000. In fairness, comparing the two, the Flow is designed for urban commuting, not highway cruising. The LiveWire can maintain highway speeds and is designed as an electric cruiser. Manufacturing numbers for the LiveWire are suspected to be low, another factor which can drive up the price. Still, young riders concerned with the environment, and happy to use a motorcycle as a daily commuter to school or arond town, will likely be more attracted to the Fuell Flow. Knowing the concerns expressed about fossil fuels, and the environmental attitudes of younger drivers, the Fuell bikes are purposely designed for urban travel. Erik Buell is back on the scene and making motorcycle history again, this time running on electric, just like that little energetic bunny.